The end of 1999 is shaping up quite well fortunately. I am now into the 900 mark and with only 101 albums to go I am looking forward to the end of this even if I know I will miss it. 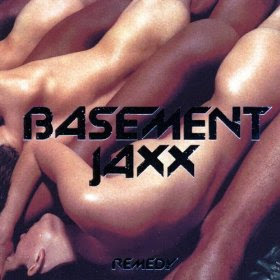 Basement Jaxx brings us what is one of the most interesting, varied and entertaining electronica albums of the late 90s. All the songs here are so recognisably different from each other, with different styles and influences that it almost sounds like a very good radio rather than an album. Fortunately this variety is consistent and Basement Jaxx's imprint is still recognisable throughout. They jump from Latin influence to break-beats to more Daft Punkish electronica without ever being less than great at it. This makes the album never boring and always dancy. Good Stuff. "Red Alert" was the first Basement Jaxx single to reach #1 on the U.S. Hot Dance Music/Club Play chart. "Rendez-Vu" would also reach #1 later in the year, and "Bingo Bango" became their third #1 single the following year.